Whisky collecting has been quite the rage. While much of the value is in the liquid contained within, some of the vessels stand on their own as art. Have it neat, say the tasting notes – the 47% ABV makes it an intense treat. One such new example: the Hibiki 35 Year-Old – which we preempt not only to be a whisky worth investing in because of its limited run, but also because this is the first time it’s being released outside of Japan. Only 200 bottles – one hundred of each design – are available worldwide. The malt and grain blend of whiskies minimum 35 years and up were selected from Suntory stock. We haven’t had a swig yet, but notes depict ripe fruit, aloe wood, vanilla and honey. The blue-and-white porcelain was done up by artisans from Arita in the Saga Prefecture, who are renown for their porcelain works. The barely perceptible white flowers are in fact a raised lattice laid over the smooth surface of the bottle, creating a duality in texture that makes it as much a joy to hold in the hands as in the mouth. 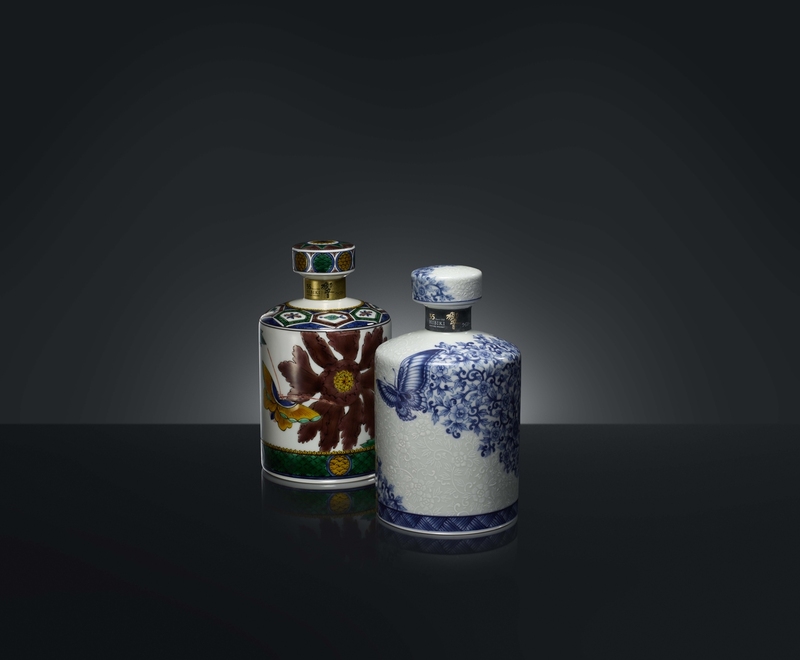 The vibrant Kutani bottle, too, speaks to a very distinctive style that’s true to the origins of the art in Japan. Five predominant colors of the gosai-de (green, blue, yellow, purple, and red) are used in the painting. A certain layer of the paint turns translucent during the kiln-firing process, thus giving the artwork unexpected depth. The allocation to the Singapore market is likely to be small – we’ll update the article shortly once those numbers – along with stockists in Singapore – are in.